During the American Revolution, the Munsee– and Unami-speaking Lenni Lenape (also called Delaware) bands of the Ohio Country were deeply divided over which side, if any, to take in the conflict. The Munsee were generally northern bands from around the Hudson River and upper Delaware River originally. The Unami were from the southern reaches of the Delaware. Years earlier, many Lenape had migrated west to Ohio from their territory on the mid-Atlantic coast to try to escape colonial encroachment, as well as pressure from Iroquois tribes from the north based around the Great Lakes and western New York. They resettled in present-day Ohio, with bands in several villages around their main village of Coshocton. These villages were named Schoenbrunn, Gnadenhutten, and Salem, and located on what was then called the Muskingum River. Modern geography places Coshocton on the Muskingum River and the three smaller villages on the Tuscarawas River. By the time of the Revolutionary War, the Lenape villages lay between the opposing interests, which had western frontier strongholds on either side: the rebel American colonists’ military outpost at Fort Pitt (Pittsburgh) and the British with Indian allies around Fort Detroit, Michigan. Some Lenape decided to take up arms against the American colonials and moved to the northwest, closer to Fort Detroit, where they settled on the Scioto and Sandusky rivers. Those Lenape sympathetic to the United States remained at Coshocton, and leaders, including White Eyes, signed the Treaty of Fort Pitt (1778) with the Americans. Through this treaty, White Eyes intended to secure the Ohio Country as a state to be inhabited exclusively by Native Americans, as part of the new United States. A third group of Lenape, many of them converted Christian Munsee and Unami, lived in several mission villages in Ohio led by David Zeisberger and other Moravian Christian missionaries. From the mid-Atlantic area, they spoke the Munsee and the Unami dialects of Delaware, an Algonquian language. White Eyes, a Lenape chief and Speaker of the Delaware Head Council, negotiated the treaty. When he died in 1778, reportedly of smallpox, the treaty had not yet been ratified by Congress. United States officials never pursued it, and the Native American state was dropped. Years later, George Morgan, a colonial diplomat to the Lenape and Shawnee during the American Revolution, wrote to Congress that White Eyes had been murdered by American militia in Michigan. Many Lenape at Coshocton eventually joined the war against the Americans, in part because of American raids against even their friendly bands. In response, Colonel Daniel Brodhead led an expedition out of Fort Pitt and on 19 April 1781 destroyed Coshocton. Surviving residents fled to the north. Colonel Brodhead convinced the militia to leave the Lenape at the Moravian mission villages unmolested since they were peaceful and neutral. Brodhead’s having to restrain the militia from attacking the Moravian villages was a reflection of the brutal nature of frontier warfare. Violence had escalated on both sides. Relations between regular Continental Army officers from the East, such as Brodhead, and western militia were frequently strained. The tensions were worsened by the American government’s policy of recruiting some Indian tribes as allies in the war. Western militiamen, many of whom had lost friends and family in Indian raids against settlers’ encroachment, blamed all Indians for the acts of some and did not distinguish between friendly and hostile tribes or bands. In September 1781, British-allied Indians, primarily Wyandot and Lenape, forced the Christian Indians and missionaries from the Moravian villages. They took them northwest toward Lake Erie to a new village, called “Captive Town”, on the Sandusky River. The British took the missionaries David Zeisberger and John Heckewelder under guard back to Detroit, where they tried the two men on charges of treason. The British suspected them of providing military intelligence to the American garrison at Fort Pitt. The missionaries were acquitted. “one Nathan Rollins & brother [who] had had a father & uncle killed took the lead in murdering the Indians, …& Nathan Rollins had tomahawked nineteen of the poor Moravians, & after it was over he sat down & cried, & said it was no satisfaction for the loss of his father & uncle after all”. The militia looted the villages prior to their burning. The plunder, which needed 80 horses to carry included everything which the people had held: furs for trade, pewter, tea sets, and clothing, A few years later, missionary John Heckewelder collected the remains of the Lenape and buried them in a mound on the southern side of the village. Although many settlers were outraged by the Gnadenhutten massacre, frontier residents, embittered by the ferocious warfare, generally supported the militia’s actions. Despite talk of bringing the murderers to justice, no criminal charges were filed and the conflict continued unabated. The Lenape allies of the British sought revenge for the Gnadenhutten massacre. When General George Washington heard about the massacre, he ordered American soldiers to avoid being captured alive. He feared what the hostile Lenape would do to captured Americans. Washington’s close friend William Crawford was captured while leading an expedition against Lenape at Upper Sandusky, Ohio. Crawford had not been at Gnadenhutten but was killed in retaliation. Captain Charles Bilderback had participated in the Gnadenhutten massacre and was a survivor of the June 1782 Crawford expedition. Seven years later, in June 1789, he was captured by hostile Lenape in Ohio, who killed him. David Williamson, the officer who led the Gnadenhutten massacre, was also a survivor of the Crawford expedition. In 1814, decades after the war, he died in poverty. The leader of the Home Guard at the time was Captain John Hay who on November 24 led an attack on the Delaware. The village site has been preserved and is listed on the National Register of Historic Places. The state reconstructed a typical mission house and cooper’s shop on the site of the village. A monument was erected in honor of those massacred, near the burial mound. Jump up^ Tuscarawas, Freepages, Rootsweb. Jump up^ National Park Service (2008-04-15). “National Register Information System”. National Register of Historic Places. National Park Service. ^ Jump up to:a b Wellenreuther, Hermann. “The Succession of Head Chiefs and the Delaware Culture of Consent: The Delaware Nation, David Zeisberger, and Modern Ethnography”, In A. G. Roeber, ed., Ethnographies and Exchanges: Native Americans, Moravians, and Catholics in Early America. University Park, Pa.: Pennsylvania State University Press, 2008. 31–48. Jump up^ Belue, Ted Franklin. “Crawford’s Sandusky Expedition”, The American Revolution, 1775–1783: An Encyclopedia 1: 416–420. Ed. Richard L. Blanco. New York: Garland, 1993. ISBN 0-8240-5623-X. Jump up^ Howe, Henry. Howe’s Historical Collections of Ohio. 1. pp. 589–90. Western writer Zane Grey included a fictional treatment of the Gnadenhutten Massacre in his historical novel Spirit of the Border (1906). Dancing through Fire (2012) by JoAnn Hague is a novel exploring the events from 1775 to 1782 which culminated in the massacre. Under the working title, Huts of Grace, the book won a 1984 Ohio Arts Council Fellowship Grant in Creative Writing. Dowd, Gregory Evans. A Spirited Resistance: The North American Indian Struggle for Unity, 1745–1815. Baltimore: Johns Hopkins University Press, 1992. Olmstead, Earl P. Blackcoats among the Delaware: David Zeisberger on the Ohio Frontier. Kent State University Press, 1991. Wallace, Paul A. W., ed. Thirty Thousand Miles with John Heckewelder. 1958/ Wennawoods reprint 1998. Trumpet in the Land, a long-running outdoor drama in Ohio, depicts the Gnadenhutten massacre and the events leading up to it. Around Hannastown those who were looked up to as special defenders were Colonel Campbell, Captain Matthew Jack, Captain Love, Lieutenant Guthrie, the Brownlees, the Brisons, the Shaws and the Wilsons. As the Indian troubles accumulated the pioneers became more and more united until in the summer of 1782 they nearly all lived in the forts and blockhouses or in close proximity with them. When a field of grain was to be harvested it was done not by the owner alone, but by the community, so that the reaping party might be more formidable in the event of an attack by the Indians. In addition to the forts at Hannastown, Fort Walthour and Miller’s blockhouse, there was in the Hannastown community a stronghold known as George’s cabin, less than a mile southeast of Miller’s, and Rugh’s blockhouse, about one mile south of the present borough limits of Greensburg. Within these places of comparative safety were collected at all times in the summer of 1782 a large part of the population of the Hannastown settlement. The land surrounding these localities and between them had nearly all been taken up by pioneer settlers. Hannastown, it will be remembered, had been a county seat for more than nine years, and the country for several miles in each direction was pretty well cleared and, for that day, thickly populated. The farmers had fenced their land, some of it at least, with stake and rider fences to protect their crops against live stock. Each farmer had cattle, horses, sheep, etc., and the community bid fair to surpass all others in the county, if, indeed, it had not already done so. Its only rival was the Pittsburgh settlement. There had been militia soldiers guarding the garrison at Hannastown, but they had deserted their post because they were not paid. Nor can they be blamed for this, for they are said to have been actually in rags when they left. The settlers were, therefore, left to take care of themselves. Farther north from Hannastown, and in many other parts of the county, farms were deserted, the owners and their families having gone to their original homes east of the mountains. The Hannastown community, because of its prominence, had special fear that if a raid was made their settlement would be the objective point. They were, therefore, unusually vigilant, but they had had no particular warning to put them on their guard. On Saturday, July 13, 1782, the men of Hannastown and the near community were engaged in cutting a field of grain for Captain Michael Huffnagle. The reader will recall him as the prothonotary who succeeded Arthur St. Clair, and also as a captain of the Eighth Pennsylvania Regiment. He had sat on the bench as a justice, had acquired considerable property, and was a man of great strength of character. In the Revolutionary service he had been wounded in the leg, and this incapacitated him for further duty in the main army, but it did not prevent him from taking a leading part in the defense of the frontier. His fields of grain lay one and a half miles north of Hannastown, the land now being owned by Jacob Longsdorf. The grain of that day, whether wheat, rye, or oats, was cut entirely by sickles, and the reapers, with their heads and bodies bent down, could be easily approached by the Indians. They had cut one field and eaten their cold dinners in the shade, and were about ready to begin on another field. One of the reapers crossed over to the side of the field bordering on the woods, and as he neared the woodland he detected Indians hiding behind the trees and stealthily awaiting till the reapers should resume their work. The reaper ran back and gave the alarm and immediately the entire party ran for their lives. Some of them secured their firearms, others ran to notify their neighbors, but the general trend was toward the fort at Hannastown. In a few minutes they reached the town, and then, in an instant almost all was commotion. Our court minutes show that court began on Tuesday, July 9, with Judge Edward Cook and his associates on the bench. It was held in the original log house built by Robert Hanna, which had been used as a court house since the formation of the county in 1773. The first thing the excited inhabitants did was to take the court records from the court room to the stockade. These are the records, heirlooms of the pioneer days, from which we have so frequently quoted, and which are yet in a good state of preservation. The door of the log jail was then broken open, and all the prisoners were set free. Able young people hurriedly assisted the children and decrepit old men and women from their houses to the stockade. The haste in which this was done may be imagined from the fact that they took with them none of their clothes, furniture nor belongings, not even provisions for a single meal. In a few minutes all were in the fort who wanted to go in, and preparations were made to close the gate of the palisades. There were several young men who did not want to enter the fort, but who preferred to stay out and fight the Indians in their own way. These were rangers whose exploits in Indian warfare have been referred to before. They regarded it as their duty to seek the protection of the fortress only after they had warned the entire settlement of the presence of the Indians. Among these were James Brison, David Shaw and Matthew Jack. There were several others, but their names have not come down to us. James Brison, is by the way, the same young man who as clerk to Arthur St. Clair kept the early court records in such splendid shape. He and David Shaw and others volunteered to go north toward the approaching Indians and learn something of their strength and their intention. There was no way for them to go but on foot, yet be it said to their credit that they went willingly. But before Shaw, Brison and their associates started, Matthew Jack had mounted his gallant horse and set out, not directly to the north, but in a circular direction, intending to pass around and reconnoiter the enemy, and learn all that could be learned there, and also notify all the surrounding settlements of their presence. The Indians did not at once pursue the reapers. Their object had evidently been to make way with them and then attack the town without warning. Thinking, perhaps, that the reapers did not know the strength of the invaders, and that they would return to pursue them, they waited nearly an hour at the grain field, instead of chasing the reapers to the fort. Captain Jack was not a citizen of Hannastown, but chanced to be in the village that day, perhaps in attendance at court, By rapid riding he very soon reached the vicinity of the grain field and discovered the strength of the band. They were apparently deliberating upon the place of attack. Jack was a ranger whose perceptive qualities had been sharpened by much usage. He saw the Indians before they saw him, and turning to ride back was followed by them. On the way he met Shaw, Brison and the others, whom he warned to run for their lives, and said he would circle around somewhat before entering the fort, and still, owing to the fleetness of his horse, be able to enter with the scouting party. He was naturally daring and courageous, and had probably no more fear of the Indians than if they had been so many wild animals. He therefore rode to the south cast and came to the cabin of the Love family, (lately the John L. Bierer farm) whom he warned to flee. He took Mrs. Love and her children on the horse behind him, and galloped toward the fort. The scouting party– Shaw, Brison and their associates– took Jack’s advice and ran as rapidly as they could toward Hannastown. The Indians, following on Jack’s trail, soon caught sight of the scouting party, and gave them a hard run for their lives. They undoubtedly mistook them for the reapers, who, they supposed, had not yet warned the citizens of the town. If, therefore, they could catch them, they could still surprise the citizens of Hannastown. On any other theory, the Indians would have shot them while on the run, but a shot fired would have aroused the town. It was a very exciting race for life. The distance was about a mile, with this advantage only on the part of the scouts, namely, that they knew the ground thoroughly, knew every short-cut path to take or hill to evade. This familiarity with the ground probably won the race for them. They knew too, that if they could reach a stream which flowed into the Crab Tree Run, from a spring near the fort, they would be safe for there they would be practically under the protection of the rifles in the fort. The foremost Indians, they concluded, would not venture much nearer than the run until they were joined by the main forces. Before they reached the creek they could hear the foot sounds of their pursuers, and a backward glance revealed the naked breasts and glistening forelocks of the savages. All of them ran directly to the fort except Shaw. He first ran to his father’s house to see if they were all safe, and then made for the stockade gate. Before he reached the gate the savages were swarming on the banks of the Crab Tree below. The fearless scout drew up his long barreled gun and, taking deliberate aim, sent his unerring ball to end the career of a warrior, and then quickly ran into the fort. He was the last to enter, and the gate was closed and barred at once. Thus all the Hannastown people had passed the stockade gates before the Indians reached the town. In Michael Huffnagle’s report he says that at about two o’clock in the afternoon the town, consisting of about thirty houses and cabins, was attacked by about one hundred and fifty Indians and Tories. When they saw that they had failed to surprise the town, and that the scalps must be fought for, if gained by them, they gave forth a prolonged indescribable Indian yell, resembling the cry of an infuriated wild beast in torture, the recollection of which alone caused those who had escaped to shudder with horror, long years afterward. The Indians then took possession of the houses and cabins in the town, in full view of the fort. Clothes and household goods were thrown into the streets. Some of the bolder Indians arrayed themselves in these clothes, and brandishing knives and tomahawks, danced in full view of the fort, though at a safe distance from it. They soon assembled to consult as to what should be done. Their gestures and talk were most vehement, but they were apparently controlled by their leaders, who seemed to be white men dressed as Indians. There seems to be no doubt but that this assembly of Indians and their renegade white leaders could have been successfully fired on bv the armed forces in the fort. But those in the fort were slow to begin battle, knowing their own weakness. They knew also that the force of Indians, though at considerable loss, could take the fort, and that their own safety lay in receiving additional strength. After the consultation was ended, part of the band, perhaps about one-third, started off in the direction of Miller’s blockhouse. There were, according to Huffnagle’s report, about one hundred remaining and about fifty in the squad which went away. In a short time those remaining set fire to the town in many places, and perhaps in every house. These houses had been built some years, and their clapboard roofs were perfectly dry. In a few minutes the entire town, save two houses which were too near the fort for them to fire, was in flames. One house left standing was Robert Hanna’s, which had served as a court house since the county was erected. The Indians found some rum and whisky in the houses, and with the aid of this they had a very jovial time while the town was burning. They paraded in the garments of the settlers in full view of the fort, but at a safe distance. One Indian, however, decked himself out in a bright colored military coat which he had taken from one of the houses. He at length grew bold, and paraded, peacock-like, too close to the stockade. Some one within, it is not known who, took a steady shot at him. The Indian leaped into the air and fell dead. Thus his vanity cost him his life. All communication with the outside world was cut off when the stockade gate was closed. There were several scouts out, but they did not return. On the contrary, they kept moving about, alarming the settlement and trying to devise some means of rescuing the inmates of the fort. The stockade at Hannastown was naturally a strong one, but on this occasion its defense was very weak. Some reports say that they had only nine firearms, some say thirteen, but all agree that they were of a poor quality, being the cast-off arms of the militia. It is possible that a few of the scouts, like Shaw and Brison, had good arms. The Hannastown people in the fort were largely elderly men and women and children. The young people of the community were at Miller’s blockhouse that afternoon, as will be seen later on. From the best testimony the writer can obtain, the Justice’s story is reasonably well corroborated. Two families named Dunlap and Courla had some time previous to this moved farther west than Westmoreland, and were driven back by the Indians in the summer of 1782. James Duncan, who has been described as a young man of superior looks and bearing, belonged to one of the returning families, and Mary Courla, a young Scotch girl who was long afterward written of as a very lovely and beautiful woman, belonged to the other. Love in this case, like wild violets, blossomed in the wilderness, and they, on their hurried flight from their frontier homes, were married near Hannastown, on July 12, 1782. In the olden time the wedding day was the bride’s day, and the next day was the groom’s, and its chief gathering was called the “Infair.” This day was often a gayer and more festive occasion than the wedding day itself. It was celebrated at Miller’s blockhouse, and this is doubtless the reason why so many young people were there that fatal afternoon. From the fact that neither the bride nor the groom were then residents in that community, and that the gay assembly was not celebrating a wedding ceremony but an infair, has probably sprung most of the doubt surrounding it. It is, moreover, on the other hand, a fact that there were but few weddings among the pioneer families during the Revolution and Indian war troubles. But the very fact that these ceremonies were so few and far between may have been the reason that so many guests were bidden and present. All accounts agree that there were many women there, chief among whom were Mrs. Hanna and her daughters. The company had perhaps all assembled. There had been dancing to the tune of a fiddle, and playing and great glee among the guests, as was the custom in that day. Everything went off merrily until about the middle of the afternoon, when suddenly, like a peal of thunder from a cloudless sky, the war whoop burst upon their ears and a band of savages rushed into their midst. Among the men who were there was Captain Brownlee, whose deeds as a ranger have been mentioned. He was also one of Captain Erwin’s bravest soldiers in the Eighth Pennsylvania Regiment. When his enlistment expired he left the service and devoted his energies to Indian fighting on the frontier. In this he was very successful. He did not discriminate between a good and a bad Indian, thinking perhaps that there were none of the former class. He thought it his duty to kill an Indian as he would a snake or a dangerous wild beast. Yet he was an excellent neighbor and a good husband and father. Indeed, it was to protect those he loved that he remained at home rather than do service in the army. Few names are better or more honorably known in border warfare than that of Brownlee. He lived on a farm a short distance northwest of Miller’s blockhouse, lately the Frederick Cope farm, and now owned by the Jamison Coal Company. On the afternoon of the Hannastown trouble some men were mowing in a field not far from Miller’s blockhouse. Their quick ears caught the rumbling of firing at Hannastown, and this was the first intimation they had of any difficulty. At once they became apprehensive of danger and hastened to the blockhouse. They left the field none too soon, for, as they were leaving it, the fifty or more Indians from the Hannastown band of marauders entered it at the other side. Here again the Indians were foiled, for they undoubtedly meant to capture the men in the field and thus have an easy victory at Miller’s. By the time the mowers reached the blockhouse the Indians were but a short distance behind and the sound of the war-whoop had already terrified the festive women and children. Some shots were fired, but the Indians very soon closed in on the frightened party and all were in the wildest confusion. A few women ran over the hills and some of them escaped. A little girl, who lived to be an old and highly respected woman, hid herself among the blackberry bushes until night came. Most of those left behind were women and children. The cries of these helpless people, mingled with the Indian yells, added to the consternation of the few fighters who were left. But the mowers did not desert them. One or two, at least, lost their lives in trying to save those who were comparative strangers to them. But, though strangers, they were defenseless women and that has always called forth the best efforts of Anglo-Saxon manhood. Those who ran at the first sign of danger made their escape by going to the George cabin, while others made good their way to Rugh’s blockhouse. Some few, like the little girl, hid in the fields till nightfall. The majority, and perhaps the more timid ones, remained in the houses and were all captured. When the Indians arrived, Brownlee was in the blockhouse, most likely as a guard, and Mrs. Brownlee and her children were also there. He seized his rifle and ran out to intercept two Indians who were just entering the yard. He could easily have escaped, and it was probably his intention to do so, with the hope of forming a strong party and overtaking them should they capture and carry away the women and children. But his wife cried to him, “Captain, you are not going to leave me, are you?” The brave man turned around and gave himself up as a prisoner to those to whom he had never before bent his knee. He had faced the hostile Indians time and again, but he could not resist the plea of his wife. No one who knew him imagined that he could make a selfish escape. Very soon the blockhouses and cabins were surrounded, and all were prisoners. Part of the Indian force was then sent out to hunt down the frightened women and children who had escaped. Most of them were soon overtaken and brought back to Miller’s as prisoners. Among those who escaped by flight was the daughter of Judge Hanna. She was taken on horseback by Samuel Findley, a pack-horse driver, and carried to the country, and thus escaped. A young man who had hastened to Miller’s to give the alarm, in making his escape took with him a child which it is said was one of Brownlee’s. He was very soon pursued by three or four Indians who were gaining on him although he could easily have distanced them in a foot race had he not been burdened by the child. This race was kept up for some time, and the young man’s strength was rapidly waning. Fortunately, he came to a thick growth of underbrush, and beyond it was a high rail fence which bordered a field of uncut rye. He passed through the brush, mounted the fence, and jumped from the top of it as far into the rye field as he could. While in the brush and crossing the fence he was out of sight of the Indians. Then he lay down on the ground in the rye with the child, which fortunately kept quiet. The Indians came up and passed him without discovering him. They soon returned and looked more closely, but did not find him. Their time was necessarily brief, and they left with many mutterings of disgust. Another young man was escaping with his child, and was also assisting his mother, an elderly woman, in the race, for a number of Indians were in hot pursuit of them, when he found that all would be captured unless he abandoned one or the other. So he put down the child, and helping his mother, they both escaped. Now comes the strange part of the story, which, by the way, is well authenticated. The Indians passed the child, perhaps unnoticed; at all events they did not kill it. The next morning the child was found in the former home safe and sound. After the storm was over it had probably innocently wandered back to it’s home. Mrs. Cruickshank also tried to escape with a child, and was assisted by her brother. They were pursued by but one Indian. Finally as he was gaining upon them, the brother turned and fired at him. The Indian dodged behind trees and the shot may have missed him. But he did not pursue them further. In the excitement of shooting at the Indian, they forgot the child and ran on without it. The next morning it, too, was found in it’s cabin home at Millers, sleeping the sleep of innocent childhood in it’s own little cot. This child lived to be an old woman. She was married to a man named Campbell, and often related the story as it was given to her from lips that had long since been silent. All these and many more were the happenings of a half-hour after the Indians reached Miller’s. Soon after the Indian party captured Brownlee, true to his promise, Captain Jack came galloping toward the house to give the alarm. As he approached he saw he was too late, for he was not slow to perceive that the yard was full of Indians. He therefore turned his horse and galloped wildly away. The Indians had remained quiet as he approached, but as he turned they sent a shower of bullets after him. They all missed him, although they whistled about his head and one cut his bridle rein. From there he rode over the country to George’s, where the fugitives from Miller’s were collecting, and where a relief party of pioneers was rapidly being organized. But the alarm was not confined to this community alone. It was a still, calm afternoon, preceding a rain when sound traveled a long distance. Many in the neighborhood heard the excessive firing and were on the alert. At Unity church, six or seven miles east of Miller’s, the congregation had met for preparatory communion services when the rumor of the incursion came. The people hastened to their homes and the pastor, Rev. James Power, who lived long afterward to tell the story, rode with his utmost speed to his home near Mt. Pleasant. Men in fields heard the distant roar of muskets, and went to their homes to make bullets, call in their children, and barricade the openings in their cabins. All near Allen’s fort were gathered there. About one and a half miles north of Greensburg, on the Salem road, lived a man named Kepple. He was in his field, and noticed his dog frisking angily about as though he scented danger. He also heard the far off rumble, perhaps from Hannastown. He hastily unhitched his horses and went to his log house, which was built for a residence and fortress both. One or two families of the neighborhood also gathered there. They at once closed up the openings and were prepared far a siege. The Indians proceeded hurriedly to secure the prisoners taken at Miller’s. The hands of the men were tied behind their backs and after taking from the houses all they wanted in the way of provisions, clothes, etc., they fired the blockhouse, which was consumed. The smaller cabins were not all destroyed. Those who went there for safety had taken with them their livestock, consisting of cattle, horses, and a few sheep. These were all shot by the Indians. Both Huffnagle and Duncan, in their reports, estimate that one hundred cattle were killed. Of the captive prisoners the most conspicuous man was Captain Brownlee. Two of Robert Hanna’s daughters were at Miller’s participating in the function that afternoon, and one was taken. They are said to have been very attractive young women. Their names were Marion and Jeanette. The captive prisoners were made to carry the goods stolen from their houses. The women and children were driven in a flock. It was a sad march, yet some stout hearts kept up, perhaps in the hope of relief by pursuing neighbors, for this was not an unusual happening in border warfare. Brownlee kept up his courage, and undoubtedly added strength to the disconsolate party. At length an unthinking woman, said to have been Mrs. Robert Hanna, through her tears, said, “Captain Brownlee, it is well you are here to cheer us up.” This unfortunate remark was undoubtedly the first intimation the Indians had that their docile prisoner was their fearless enemy, Captain Brownlee. All the Indians knew him by name and reputation, but few Indians who met him face to face ever disturbed settlers afterwards. After all was over it was plain to Captain Brownlee’s friends that he was all the while attempting to conceal his identity with the hope of keeping up the concealment for a day or so, when all might be rescued. None knew better than he that his days were numbered when the Indians discovered who he was. It was thus to conceal his name that he gave himself up when resistance would probably have availed him nothing. He kept quiet and was extremely meek when they tied his hands and placed heavy burdens on his back. All this was entirely unlike the bold and fearless Brownlee, whom the Indians knew of only. All his acts were now apparently indicative of perfect submission. He was evidently trying to deceive them. All his friends, both among the prisoners and among those who were free, believed implicitly that he would soon escape, perhaps that night and return with a full knowledge of their strength and how best to follow and attack them. If so he could raise a company which would avenge the outrage at Miller’s. But at the time, his name was mentioned by the unfortunate woman his doom was decided on. Immediately there were hasty glances from one Indian to another, and two of them in guteral tones consulted together. In addition to his burden he was carrying one of his children on his back. As he bent down to enable the innocent child to cling more tightly with its arms around his neck, a savage sneaked up behind him and buried a hatchet in his brain. Brownlee fell dead, and the child rolled over him. As it was scrambling to it’s feet the Indian killed it in the same way. A woman near by screamed and fell swooning to the ground. She met with the same ill fate, the Indians doubtless mistaking her for the wife of Brownlee. Mrs. Brownlee, on account of her children and the other captives, was compelled to witness these barbarous deeds in the silent agony of despair. The Brownlees’ bodies and that of the woman were found about one half mile from Miller’s, and were buried as was the custom then on the spot where they fell. Over his grave stood a wild cherry tree which grew to immense size and marked the spot for many years. A second grew from its roots or stump, and it is now half grown, and is preserved by the owner of the field, Mr. J.J. Blank. It is but a short distance east from his residence. The farm was formerly the Meckling farm. The march of the captives was toward Hannastown, and, when there, they joined the band which had remained to burn the town. About dark the entire band changed their location, moving to the northeast, and encamping for the night in the ravine, or hollow made by Crabb Tree creek. There they partook of what provisions they had. Some watched the prisoners, while others attended a council to deliberate what should be the next move. While the detached band of Indians was destroying the Miller blockhouse and returning with their prisoners, the Indians at Hannastown kept a close watch on the fort. They also kept up an irregular fire on it all afternoon. They were evidently afraid to attack it; they did not know of its real weakness. Those within had only feelings of hope and fear. If their neighbors could not unite and rescue them they expected captivity and death the next morning. The romantic event of the afternoon was the shooting of Margaret Shaw. The story of this young girl’s death has been repeated many times, but it never grows old. It has been exaggerated by romanticists but the simple story makes her character and actions so beautiful and attractive that no false coloring is necessary. She has lived since, and always shall live in the sad story of that day, as a genuine heroine of Hannastown. She was the daughter of Moses Shaw, and the sister of Alexander and David Shaw. Both of her brothers were hunters and scouts, and both were well known Indian fighters and rangers. David had entered the Revolution as a substitute for his father. When his term of enlistment expired he came home like Brownlee to assist in border defense. Like Brownlee, too, he thought it was always right to kill an Indian. Otherwise he was a man of most gentle nature, and was living up to his general reputation when, before he entered the fort he first ran to ascertain whether his father’s family had been taken in or not. Margaret (or Peggy as she was called), resembled him in the gentleness of her disposition. She was about fourteen years old, but large and strong for her age. During the afternoon in the fort the older people were devising means of defense should an attack be made, and perhaps the children were somewhat neglected. Inadvertently a small child wandered toward the picketing of the fort, and was in a section of the enclosure which was within the range of the enemy’s bullets. Seeing this, Margaret ran to it to fetch it back to safety. As she bent down to pick it up a bullet struck her in the breast and penetrated her right lung. With the skill in surgery of our present day she might easily have recovered. As it was, she lingered two weeks and had wasted away until she was but a mere skeleton, when death relieved her. She was buried at a Presbyterian graveyard two miles north of Mt. Pleasant, now known as the Middle churches. Thus it will be seen that there was a great deal of firing at Hannastown, and this, among other things, aroused the entire community. The men assembled at George’s are said to have fired all their guns at once to arouse the neighborhood. About forty men gathered there by dark. All were bent on rescuing the prisoners in the fort. The night fortunately brought dark clouds and rain which favored the rescuing party. Only about thirty of them were able to go to the relief of the fortress. Suspicions of cowardice were hinted for long years afterwards, concerning some who failed to accompany them. Of these thirty, many were on horses and all were armed. The location of the Indians, the destruction of the town, etc., was all reported by scouts who, by much practice, were as wary as the Indians themselves. The party advanced with great caution. They could see from the gleam of burning logs the outline of the fort with its whitewashed palisades. As they crept up to it the scouts made known their arrival, the gates were opened and all entered in safety. As soon as the evening meal was over the Indians proceeded to divide their plunder. Many of them attired themselves in the new garments which fell to them. One unusually large Indian tried to array himself in a silk dress, but could not get his foot through the sleeve. His attempts were very ludicrous, and he seemed highly pleased that he could make others laugh so heartily. They also prepared to celebrate their victory. One captive was selected, his body painted with black stripes, and tied to a tree. He was to be tortured by being burned alive. They also made the prisoners run the gauntlet, the men first and then a number of the women. Some of them were very badly beaten. The daughter of Robert Hanna was put through, but had gained the favor of an Indian by laughing at his grotesqueness when arrayed in the silk dress, and therefore got through without great injury. But a young woman named Freeman, who had red hair, which was always held in contempt by the dark-haired race, was beaten nearly to death. More than a generation afterward she was treated by Dr. Postlewaite, in Greensburg, for injuries to her skull received that night. But about twelve o’clock the Indians discovered that forces were arriving at the fort. They did not have time to torture the prisoner, so they tomahawked him and soon afterward began their march. It was believed by those in the fort that an attack would be made in the morning, so they tried to deceive the Indians by making them think that very large forces had arrived. Some old drums were brought out and beaten. There was a wooden bridge across the entrance to the fort, and all the horses were galloped across this bridge to the music of the drums. They were then taken around the bridge and brought over several times. All in the fort were now hilarious, or acting so, at least, and, as was intended, these acclamations of joy, apparently over the arrival of forces were plainly heard by the Indians. It was, moreover, not unlikely that by twelve or one o’clock forces should arrive from Fort Pitt or Fort Ligonier, and the stratagem had its desired effect on the minds of the Indians. As soon as possible, therefore, they moved with their prisoners and baggage, stealing away so silently that no one in the fort knew they were going. They traveled north, passing between Congruity and Harvey’s Five Points and on northward, crossing the Kiskiminetas at about where Apollo now stands. When morning came those in the fort were delighted to learn that the Indians had gone. The forces followed them as far as the place where they crossed the river, but could not pursue them into the Indian country, which was then a wilderness. For their failure to pursue them further they have been more or less censured, but we think unjustly. There were at least one hundred and fifty well-armed Indians and Tories, and the forces in the fort, including the relief party from George’s, did not amount to more than fifty, if both old and young should join in the pursuit, which was practically impossible. The Indians had with them about twenty prisoners, whom they had taken at and near Miller’s. Their march to Canada was comparatively without incident, unusual in such parties, though it was a trying ordeal on the cast down and over-burdened prisoners. Arriving in Canada they sold both prisoners and scalps to the English for beads, trinkets, firearms and whisky. The prisoners were kept until a final peace was effected between Great Britain and the colonies, after which most of them found their way back to Westmoreland county. It has been often said that one of the daughters of Robert Hanna, Marian, was married to a British officer but this has been partly disproved by recent researches. Of those who are known to have helped to rescue the fort and follow the Indians to the river, not yet mentioned here, were the Craigs, the Sloans, Captain David Kilgore and two of his sons. Captain Wendel Ourry was also with them. James Moore, of Salem township, who died in 1846, aged seventy-three, was in the fort. He was a child living with his widowed mother in Hannastown when the great calamity overtook it. From Miller’s was taken Dorcas Miller, a daughter of Captain Samuel, and her younger brother, whom they killed because he could not travel rapidly enough. Dorcas was kept at Niagara, and some three years afterward was ransomed and sent home by a British officer named Butler, who knew her father. She came home, and was afterward married to Joseph Russell, residing most of her life on the farm where she was captured. She died in Greensburg, March 15, 1851.
Who commanded the Indian forces on the Hannastown raid will never be certainly known. Some have written that it was Simon Girty. This is now known to be an error, for it is latterly pretty well proved that he was in Kentucky at that time. The leadership of nearly all incursions of that character was attributed to him. It was more likely Guyasutha on the part of the Indians, and Connolly of the Dunmore’s war fame on the part of the white Tories, though his presence was never proved. The Indians were mainly from a small tribe called Munsies, then in northern Pennsylvania. Captain Matthew Jack and David Shaw were for many years justly called the “Heroes of Hannastown War.” Jack was sheriff of the county at the time, which probably accounts for his being at Hannastown that afternoon. He was also a county justice, and was all-around one of the most noted and daring Indian fighters of his day. He was a man of great strength and agility, and was without personal fear. Often in after years, at barn-raisings, musters, etc., he illustrated his manner of riding that day. He could place his hat on the ground and pick it up as he galloped by. Later he was known as General Jack, from his prominence in the Whisky Insurrection. He was born in 1755, and died November 26, 1836. Both he and his wife, Nancy (Wilson) Jack (born 1760, died September 20, 1840), are buried at Congruity, about seven miles northeast of Greensburg. Hannastown was never rebuilt, though the courts were held there (the courthouse not being burnt) for more than four years afterwards. Cities of untold wealth and power have risen, but few of them have achieved as glorious a record in history as this little collection of mud-plastered log huts, built in the heart of a primeval forest in western Pennsylvania. It was perhaps at its best in 1782. when it was burned. On February 5, 1829, a petition was presented to the legislature of Pennsylvania by the wife of Captain Brownlee, asking for a pension, and from it we gather the following: She was born in Londonderry, in 1755, her maiden name being Elizabeth Guthrie, and was a daughter of John Guthrie. With her father she came to this country in 1771, and settled in Westmoreland county, near the present town of Greensburg, in 1772. During Dunmore’s war they were repeatedly compelled to fly to Hannastown for safety. In 1775 she was married to Captain Brownlee, who was with Erwin as a rifleman in the Revolution, and was taken a prisoner at the battle of Long Island. After serving his time in the Revolution he came home and engaged in Indian warfare until the burning of Hannastown. He, with his wife and children, were captured at Miller’s fort. In that petition it is stated, also, that it was Mrs. Hanna, the wife of Robert Hanna, who mentioned Captain Brownlee’s name in the presence of the Indian captors, and thus led to his identification and death, as indicated above. From there they were taken to Cataraugus, a journey of thirteen days, during which the prisoners, unable to subsist on the scanty fare of the Indians, almost perished from hunger. From Cataraugus they were taken to Buffalo, where the Indians concluded, because of Mrs Brownlee’s weakness, she being greatly reduced by fever and ague, to burn her at the stake. But a white man, Captain Lattridge, told them she was too far reduced to afford them any amusement and prevailed upon them to sell her for whisky which would afford them much more pleasure. So they listened to his advice, and she and her child which she carried tied to her back, were marched to Niagara and sold for twenty dollars and two gallons of rum. There she was better cared for, and finally arrived in Montreal. When peace was declared, after many hardships, she returned to Hannastown. Two years later she was married to Captain William Guthrie, captain of the rangers in protecting the frontier. Guthrie was a good Indian fighter but a poor farmer, and afforded her but a scanty living. He lived until 1829, when he was killed by falling from a wagon which went over the side of a high bridge. John Beatty, Robert Orr, Sr. and Jane Beatty testify to these statements. By act of March 23, 1829, she was paid $60, and $60 per year thereafter as long as she lived. Mrs. Robert Hanna’s maiden name was Elizabeth Kelly, a daughter of John Kelly, and she was a sister of Colonel John Kelly, a member of the first Continental convention, also a soldier in the Revolution. Both she and her daughter were taken to Montreal, where they were kindly treated, through the efforts of Rev. William Hanna, an Episcopal minister. They were released in December, 1782, and returned home by way of Lake George, Albany, New York and Philadelphia. Jeanette Hanna, the captured daughter, afterward married David Hammond, an officer in the Revolution. They were the parents of General Robert Hanna Hammond, who fought in the Mexican war. They were buried near Milton, Pennsylvania. The destruction of Hannastown and the injuries inflicted on the community in connection with it were much more serious and far-reaching than the reader may at first blush imagine. Its evil effects cannot be estimated in dollars and cents, though when viewed, even from that standpoint alone, it was a fearful calamity. For almost a quarter of a century western Pennsylvania had been gradually increasing, with Hannastown as its chief center and seat of justice. Rude though its log cabins may have been, they were the best in the community, and with their contents represented many years of toil and sacrifice. Here the hardy pioneer had expended his best energies in taming the land, and building up a civilization. Upon the perpetuity and growth of law and order depended the values of their properties, not only in Hannastown but all over Western Pennsylvania. But now all for which they labored had been swept away by a single blow, and the word went east to prospective settlers and land purchasers that in Westmoreland county, even under the shadow of the temple of justice, savage warfare prevailed, property was ruthlessly destroyed and life itself was in constant danger. With the exception of a country store and a few old houses at Hannastown, built long since the original town was destroyed, there is nothing there to point the inquiring stranger to one of the most historic spots in western Pennsylvania. When it was burned the war for Independence was practically over, for Cornwallis had surrendered to Washington in October of the previous year. Its destruction was in reality the last instance in America during the Revolution, in which the English united with their savage allies to destroy the innocent pioneer by what can be called little else than common butchery. The site of Hannastown is now farming land, owned by Mr. William Steel. Moravian Massacre https://en.wikipedia.org/wiki/Gnadenhutten_massacre and http://www.history.com/topics/gnadenhutten-massacre and http://gnadenhutten.tripod.com/. By Will Vawter (1871–1941) – Conquest of the Country Northwest of the River Ohio by William English, vol. 2, Public Domain, https://commons.wikimedia.org/w/index.php?curid=1327161. The Munsee Indians were part of the Delaware tribe, and related to the Moravian Indians that had been slaughtered a year earlier. For more info, see https://en.wikipedia.org/wiki/Munsee. and http://www.munseedelawareindiannation-usa.us/page07.html. and https://www.amazon.com/Munsee-Indians-History-Civilization-American/dp/0806140623. “No licensed murder: no famine introduced by law? Adopted at a general meeting of the inhabitants of the County of Westmoreland, held at Hanna’s Town the 16th day of May, 1775 for taking into consideration the very alarming situation of the country, occasioned by the dispute with Great Britain. From: “A Genealogy of the Descendants of James Steele and his Wife Mary” by Donley M. Steele, 1919. Head of Family No. 1. Our earliest paternal ancestor of whom we have any record, was one James Steel. He was born in Ireland of Scotch-Irish parents. Family tradition says that James came to America when he was about 18 years of age. He came as a stowaway and encountered great hardships on account of the ship being disabled by storms and drifting far out of her course, the voyage consuming about three months. There are traditions and some indications that James was accompanied to America by two brothers, named respectively, John and Thomas, but we have been unable to find the necessary data to prove such fact. Soon after landing in America, James was bound out to a hat maker in Philadelphia, Pa., where he learned the hatter’s trade and later opened up a hat shop of his own in Pittsburgh, Pa.
His next move was up the Monongahela River to the town of Brownsville and it was there that he met and married a widow named Mary Peterson. It seems that Mary (Peterson) Steele owned a farm about two miles out of Brownsville, where she and James lived with her parents. James conducting a hat shop in Brownsville while living on the farm. We find no data of the facts but it is supposed that James Steel’s three sons were born on that farm near Brownsville, Pa.
About the year 1788, the family moved up the Monongahela River and settled in what is now known as Clinton Dist., Monongalia Co., W. Va. They built their pioneer cabin beside a good spring, near Booths Creek, about seven miles above Morgantown. The old log cabin has been gone for many years but title to the land has not passed from Steele descendants. The tax lists of Monongalia Co. show that James Steel acquired by patent and purchase, 185 acres of land in Clinton Dist. and paid taxes on that amount in 1790. He continued to pay the same taxes until 1805 when he began to take up more land in the same locality and in the year 1806 he was taxed on 493 acres. Records show that Mary (Peterson) Steel was born in 1737 and died Nov. 13th, 1829, at the age of 92 years. James was born in 1732 and died Nov. 2nd, 1840, at the advanced age of 108 years. Upon reaching the age of 81 years he quit having birthdays and claimed 81 as his age during the remainder of his life, and the “Age 81 Years” engraved on his monument humors his desire in that respect. James Steel was a pioneer of good and sturdy stock; generous hearted, resourceful, indomitably courageous and optimistic. The mortal remains of James and his good wife Mary are buried in Pisgah Churchyard, Clinton Dist., Monongalia Co., W. Va.
Children of James and Mary (Peterson) Steel. John. Born Feb. 19th, 1766, near Brownsville, Pa.
Married Margaret Robinson, July 7th, 1796, in Monongalia Co., (W.) Va.
Died July 10th, 1821. Buried at Pisgah Church, Monongalia Co.
James, Born Jan. 3rd, 1769, near Brownsville, Pa.
Married Elizabeth Stevens, June 12th, 1807, in Monongalia Co.
Died Sept. 7th, 1829. Buried at Pisgah Church, Monongalia Co.
Thomas, Born June 11th, 1771, near Brownsville, Pa.
Married Eleanor Thorn, March 21st, 1801, in Monongalia Co. (W.) Va.
Died Sept. 20th, 1848. 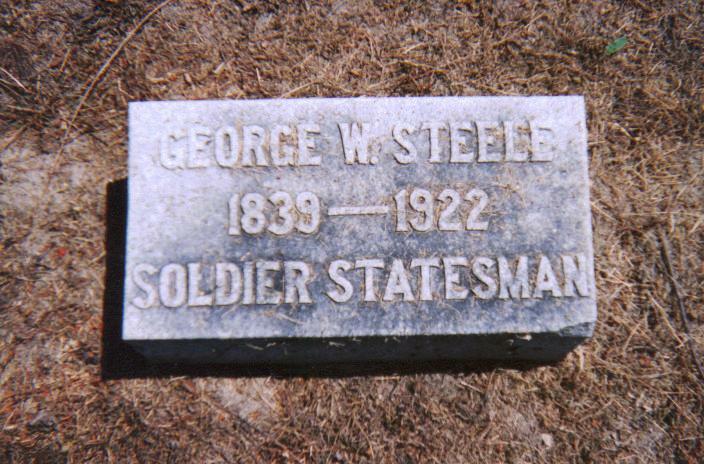 Buried at Pisgah Church, Monongalia Co.
George Washington Steele (December 13, 1839 – July 12, 1922) was an American lawyer, soldier, and politician who twice served as a Congressman for Indiana, from 1881 to 1889 and again from 1895 to 1903. Steele was also the first Governor of Oklahoma Territory and was instrumental in developing the state’s public education system and its two largest universities. Steele was born to Asbury and Marie Louise Steele in Fayette County, Indiana, on December 13, 1839. He received an education from Indiana’s public school system and then earned a law degree from Ohio Wesleyan University. Following the completion of his education, Steele passed the bar exam and set up a practice in Hartford City, Indiana. Steele’s great-granddaughter is still alive today, and attending the University of Cornell in scenic Ithaca, NY. She is married but has not had children yet. Steele continued his law practice until 1861 with the outbreak of the American Civil War. Indiana stayed loyal to the Union, and Steele joined the 12th Indiana Regiment in the Union Army as a volunteer on May 2, 1861. He later transferred to the 101st Indiana Regiment, in which he served until the conclusion of the war. 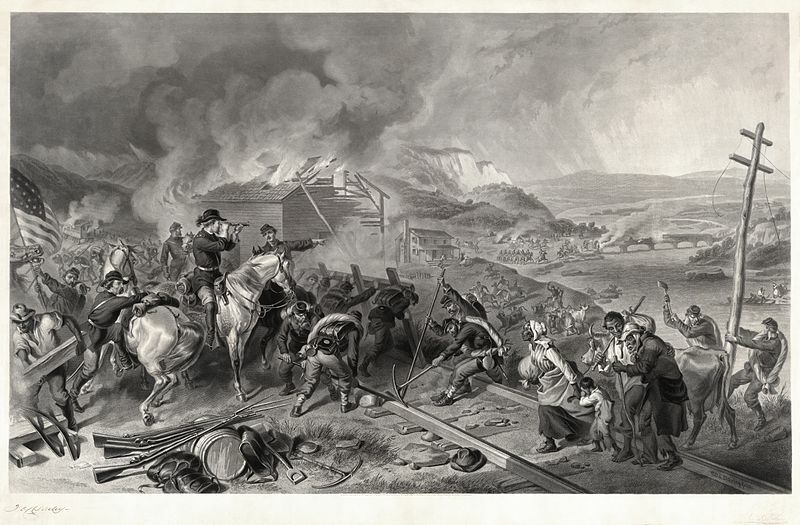 Steele served under Maj. Gen. William Tecumseh Sherman in his famous March to the Sea. Following the Carolinas Campaign and the end of the war, Steele was promoted to the rank of lieutenant colonel in July 1865. After the Civil War ended in the Union’s favor and with the United States restored, Steele transferred from the volunteer army to the Regular Army. Steele was promoted to the rank of major and served in the 14th U.S. Infantry. His commission lasted for ten years, from February 23, 1866, to February 1876. Following his retirement from the army, Steele returned to Indiana, where he settled in Marion and established a business that engaged in agricultural pursuits and pork packing. Steele’s loyalty to the Union led him to join the Republican Party. He became active in local politics and gained enough support to win the race to serve as a Congressman from Indiana’s 11th District in 1880. Steele was inaugurated on March 4, 1883. He retained his post for eight years, winning reelection in 1882, 1884, and 1886. 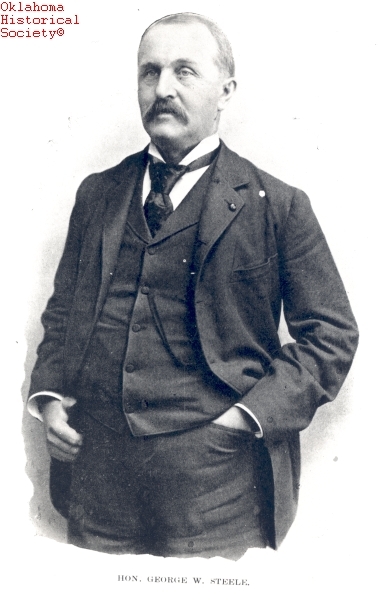 After officially leaving office on March 3, 1889, Steele returned home to Marion. 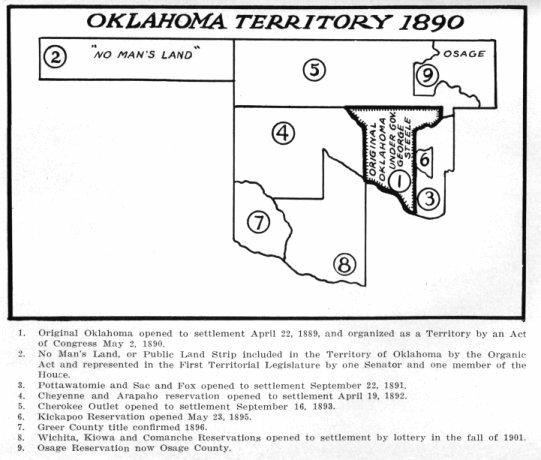 Within a year’s time, on May 2, 1890, the western portion of the unorganized territory of modern day Oklahoma became the Oklahoma Territory. Upon hearing reports of disorder and chaos in the new territory, President Benjamin Harrison wanted a former military officer to serve as the territory’s first governor. Harrison appointed Steele to the office, and on May 22, 1890, Steele was inaugurated in Guthrie, Oklahoma Territory. Immediately upon entering office, Governor Steele declared a state of emergency throughout the Territory. This allowed him to best use his experience as a military officer. Steele supplemented the orderly processes of government for the Territory’s disorderly situation. Unfortunately for the Governor, much of his time was occupied with a dispute with the Oklahoma Territorial Legislature. The Legislature wanted to move the capital from Guthrie, first to Oklahoma City then to Kingfisher. All of these bills were vetoed by the Governor. Steele also urged the creation of a public school system and universities of higher education in the Territory. Through his work, the Legislature approved and established two universities: one in Norman and another in Stillwater. The Norman Territorial University would become University of Oklahoma, with the Stillwater A&M College becoming Oklahoma State University. After only seventeen months in office, Governor Steele resigned the governorship effective October 18, 1891. In his place, President Harrison appointed Abraham Jefferson Seay to the governorship. Robert Martin, Secretary of Oklahoma Territory, served as Acting Governor from October 18, 1891, until February 1892, when Governor Seay took the oath of office. Returning to Marion, Steele remained a private citizen until he reentered state politics in 1894 when he was elected to once again represent Indiana’s 11th District in the United States House of Representatives. His term officially began on March 4, 1895. While in the House, Steele served as the Chairman for the House Committee on Manufactures, during the 57th United States Congress. 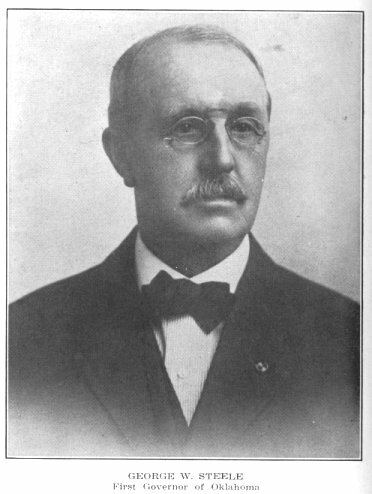 Steele remained in office as a Congressman until 1903, after serving eight years. The existence of the Marion Branch was due, in great part to the leadership of George Steele, Sr. of Marion, who represented the 11th Congressional District of Indiana form 1880 to 1890. During his last term, he introduced legislation to establish a branch home in Grant County in the fiftieth session of congress, the measure coming up in December, and for seven months he watched the proceedings. The bill was approved by an Act of Congress and signed by President Grover Cleveland on July 23, 1888, entitled: “An Act to authorize the location of a Branch Home for Disabled Volunteer Soldiers in Grant County, Indiana, and For Other Purposes”. 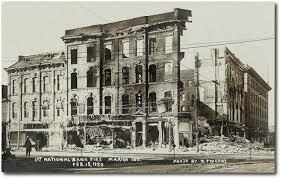 First National Bank of Marion after 1920 fire. Approval of Steele’s bill was received with great enthusiasm in Marion, where the local newspaper predicted that the expenditure for the branch would total at least $500,000. News of the bills passing was favorably received in Grant County and on July 30, 1888 a celebration took place and it was estimated that the streets of Marion were thronged with the largest assemblage ever reported in Marion. In early 1890 Steele became the first President of the First National Bank in Marion. 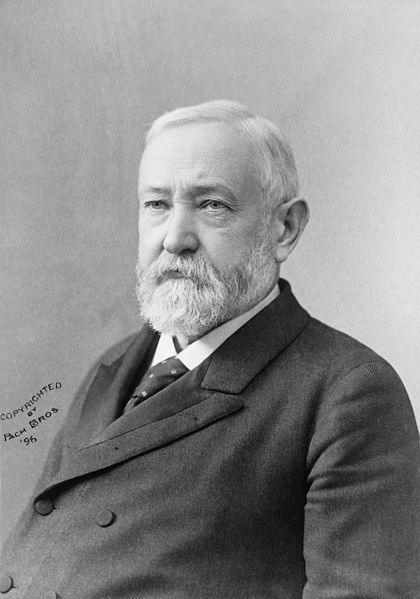 However, at the request of President Benjamin Harrison, he took the position of governor of the Oklahoma Territory from mid 1890 to late 1891. Upon his return to Marion in 1894, he was elected Congressional representative for four more terms. Steele also served on the Board of Managers of the National Military Home at Marion from April 21, 1890, to December 10, 1904. On December 11, 1904, Steele became the third director of the Marion Branch, moving to the Director’s House on the grounds and serving until his retirement on May 31, 1915. Steele once again returned to life as private citizen in Marion. At the age of 83, Steele died on July 12, 1922 in Marion. He is buried there in Odd Fellows Cemetery. “George Washington Steele”. Ancestry.com. Retrieved October 10, 2012. Dan W. Peery, “George W. Steele,” Chronicles of Oklahoma, Vol. XII, pp. 383 et seq. ; “The First Two Years,” Chronicles of Oklahoma, Vol. VIII, pp. 94 et seq. Peery, Dan W. “George W. Steele: First Governor of the Territory of Oklahoma”. Chronicles of Oklahoma 12:4 (December 1934) 383–392 (accessed August 28, 2006). Meserve, John Bartlett. “The Governors of Oklahoma Territory”. Chronicles of Oklahoma 20:3 (September 1942) 218–227 (accessed August 28, 2006). Wikimedia Commons has media related to George Washington Steele. Writing poetry has been in the family for the past three generations– four counting this latest one. I recall being about ten years old, following along with my dad, “shootin’ trouble” on the railroad. He would take a moment from time-to-time to educate his young son on the finer aspects of his work. 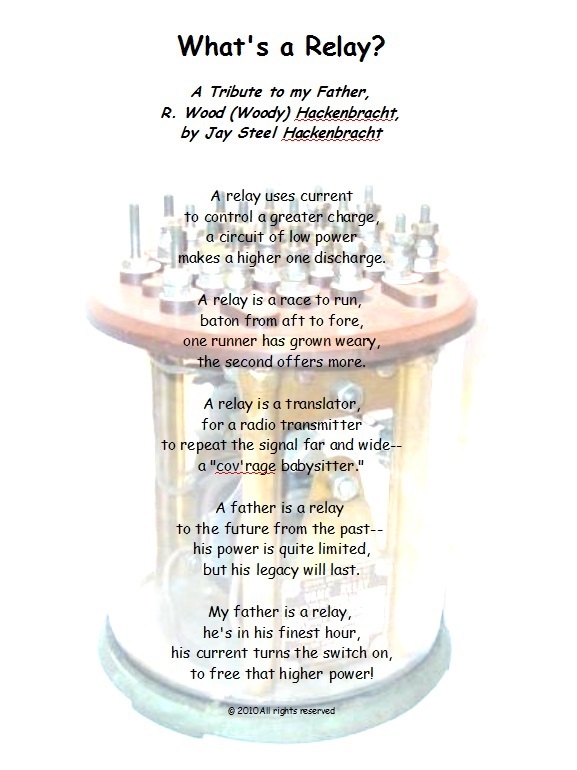 In railroad switch houses, on more than one occasion, he explained what a relay was– it was a great improvement over the old manually-controlled railroad switches. His artistry was in his actions more than his words, and as a pre-teen, I never did quite understand what he was talking about. All I saw were glass jars and a seeming rat’s nest of electrical wires. The years went by, and I had my own two boys and a career of “shootin’ trouble” in marketing and information technology. Now, I think I know what he meant about a relay. Ever hear the expression, “getting your ship only 95% of the way into port?” Ever work a project that gets all but the delivery done? Ever build a new bathroom that is fully functional except for the water? That last 5% of the project is critical to the conclusion of a successful project. So, here is your worst-case scenario– How do you park an aircraft carrier? It’s not much like parking your grandmother’s Buick. Bringing the giant aircraft carrier USS Abraham Lincoln safely into its home pier in Everett, or any other pier, requires scores of personnel, knowledge of an area’s tides and winds and a host of specialized skills. “It’s a constant battle if the tide is ebbing or the wind is blowing — trying to take us away from the pier,” said the ship’s navigator, Cmdr. Charles Luttrell. The aircraft carrier is scheduled to arrive about 2 p.m. today from an exercise in Southern California waters. The idea is to avoid crashing into anything. Decades-long Navy careers are in jeopardy if there’s a collision or the ship goes aground. It’s general knowledge aboard that there’s no such thing as a routine docking. The tension increases dramatically on the bridge and in the forecastle when a ship, which can displace close to 100,000 tons, approaches land. The Lincoln enters the Strait of Juan de Fuca, staying in the designated shipping lanes. A group of key people — from the commanding officer down to the enlisted master helmsman — meet to discuss weather, vessel traffic and other things that could affect a successful docking. The backup systems have backups. Tugs are at the ready, though still far away in Port Gardner. “If, God forbid, we lose power, we’ve got to be ready to set the anchor,” said Lt. Cmdr. John Regelbrugge, a former deckhand who is known as the “first lieutenant” and is in charge of setting the “special sea-and-anchor” detail. A dozen coils of 600-foot-long Kevlar mooring lines are at the ready, each capable of withstanding a strain of 280,000 pounds of pressure. Other crew members are prepared to go steer the ship manually in the unlikely event of a power failure. Lookouts are positioned, equipped with laser range finders. There will come a time in the docking that the commanding officer will want to know how many feet the ship is from the pier where it will tie up. A young, experienced helmsman gets on the electronically controlled wheel. Knowing when to turn the ship is critical, especially as speeds diminish. Commanding officer Capt. Patrick Hall and the helmsman need to have a mutual understanding and trust, Luttrell said. The Lincoln’s course jogs in a southwesterly direction in Admiralty Inlet and then makes an abrupt, almost 90-degree, turn east at the foot of Whidbey Island. The ship starts to slow from its previous speed of about 25 miles per hour. Once around the foot of Whidbey, the Lincoln turns north again, crossing the state ferry route between Clinton and Mukilteo. The ship is constantly in radio communication with the ferries, deciding whether the Lincoln should pass in front of or behind one of the regularly scheduled passenger boats. By this time, the carrier has slowed and Regelbrugge calls out his detail of 100 or so people who will handle the lines and watch for obstacles. The Lincoln continues to slow. A harbor pilot boards from a tug and heads for the Lincoln’s bridge, and a decision is made whether to twist the ship to the left or right when it approaches the pier. The port side of the Lincoln has a single large elevator able to lift warplanes from the hangar deck to the flight deck. The starboard side has three. The Lincoln must always tie up with the three elevators next to the pier. Therefore, it has to turn around. A left turn is more comfortable for Luttrell. “A right twist is very uncomfortable because you lose sight of the pier,” he said. A lot depends on the advice of the pilot, he added. Within 1,500 yards of the pier, the carrier is traveling a little less than 2 mph, and the tugs start their approach to help battle tide and wind. It could easily take an hour or more for the big ship to nestle up to the pier after it starts its spin. It looks routine. It never is. As the carrier twists into position, the tugs nudge the huge warship toward the pier, just barely moving. And when the lines are safely attached to the pier, people like Luttrell can finally relax. 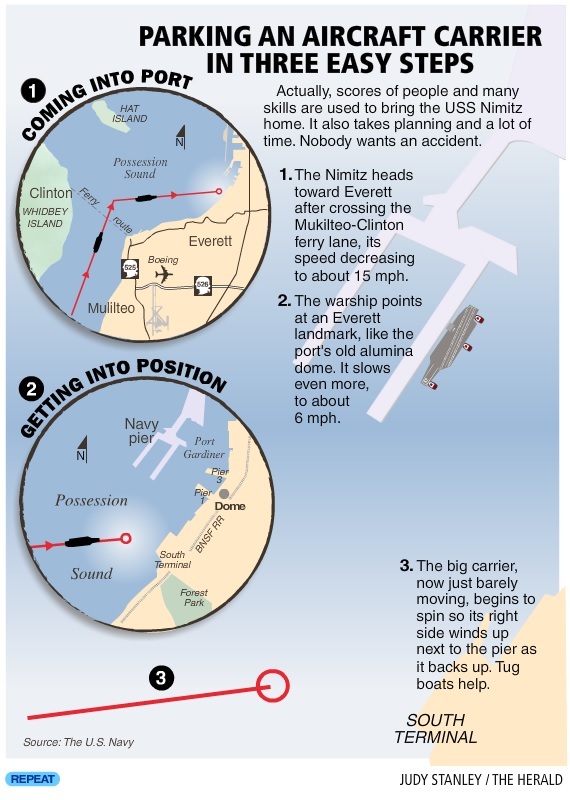 Tense as it may be, parking the Lincoln at Naval Station Everett is easier than docking at most other locations, Luttrell said, partly because the surrounding water here is deep. “That’s the advantage we have over everyone else,” Luttrell said. Reporter Jim Haley: 425-339-3447 or jhaley@heraldnet.com. Published: Thursday, August 26, 2010, 11:51 a.m.